Neomycin and polymyxin B sulfates and bacitracin zinc ophthalmic ointment is a sterile antimicrobial ointment for ophthalmic use. Each gram contains: neomycin sulfate equivalent to 3.5 mg neomycin base, polymyxin B sulfate equivalent to 10,000 polymyxin B units, bacitracin zinc equivalent to 400 bacitracin units in a white petrolatum and mineral oil base. Neomycin sulfate, polymyxin B sulfate, and bacitracin zinc together are considered active against the following microorganisms: Staphylococcus aureus, streptococci including Streptococcus pneumoniae, Escherichia coli, Haemophilus influenzae, Klebsiella/Enterobacter species, Neisseria species, and Pseudomonas aeruginosa. The product does not provide adequate coverage against Serratia marcescens . Neo-PolycinTM Ophthalmic Ointment is indicated for the topical treatment of superficial infections of the external eye and its adnexa caused by susceptible bacteria. Such infections encompass conjunctivitis, keratitis, and keratoconjunctivitis, blepharitis and blepharoconjunctivitis. Neo-PolycinTM Ophthalmic Ointment is contraindicated in individuals who have shown hypersensitivity to any of its components. NOT FOR INJECTION INTO THE EYE. Neomycin and polymyxin B sulfates and bacitracin zinc ophthalmic ointment should never be directly introduced into the anterior chamber of the eye. Ophthalmic ointments may retard corneal wound healing. Topical antibiotics, particularly neomycin sulfate, may cause cutaneous sensitization. A precise incidence of hypersensitivity reactions (primarily skin rash) due to topical antibiotics is not known. The manifestations of sensitization to topical antibiotics are usually itching, reddening, and edema of the conjunctiva and eyelid. A sensitization reaction may manifest simply as a failure to heal. During long-term use of topical antibiotic products, periodic examination for such signs is advisable, and the patient should be told to discontinue the product if they are observed. Symptoms usually subside quickly on withdrawing the medication. Applications of products containing these ingredients should be avoided for the patient thereafter (see PRECAUTIONS: General). As with other antibiotic preparations, prolonged use of neomycin and polymyxin B sulfates and bacitracin zinc ophthalmic ointment may result in overgrowth of nonsusceptible organisms including fungi. If superinfection occurs, appropriate measures should be initiated. Bacterial resistance to neomycin and polymyxin B sulfates and bacitracin zinc ophthalmic ointment may also develop. If purulent discharge, inflammation, or pain becomes aggravated, the patient should discontinue use of the medication and consult a physician. There have been reports of bacterial keratitis associated with the use of topical ophthalmic products in multiple-dose containers which have been inadvertently contaminated by patients, most of whom had a concurrent corneal disease or a disruption of the ocular epithelial surface (see PRECAUTIONS: Information for Patients). Allergic cross-reactions may occur which could prevent the use of any or all of the following antibiotics for the treatment of future infections: Kanamycin, paromomycin, streptomycin, and possibly gentamicin. Patients should be instructed to avoid allowing the tip of the dispensing container to contact the eye, eyelid, fingers, or any other surface. The use of this product by more than one person may spread infection. Patients should also be instructed that ocular products, if handled improperly, can become contaminated by common bacteria known to cause ocular infections. Serious damage to the eye and subsequent loss of vision may result from using contaminated products (see PRECAUTIONS: General). If the condition persists or gets worse, or if a rash or allergic reaction develops, the patient should be advised to stop use and consult a physician. Do not use this product if you are allergic to any of the listed ingredients. Keep tightly closed when not in use. Keep out of reach of children. Long-term studies in animals to evaluate carcinogenic or mutagenic potential have not been conducted with polymyxin B sulfate or bacitracin. Treatment of cultured human lymphocytes in vitro with neomycin increased the frequency of chromosome aberrations at the highest concentration (80 µg/mL) tested; however, the effects of neomycin on carcinogenesis and mutagenesis in humans are unknown. Polymyxin B has been reported to impair the motility of equine sperm, but its effects on male or female fertility are unknown. No adverse effects on male or female fertility, litter size, or survival were observed in rabbits given bacitracin zinc 100 gm/ton of diet. Animal reproduction studies have not been conducted with neomycin sulfate, polymyxin B sulfate or bacitracin. It is also not known whether neomycin and polymyxin B sulfates and bacitracin zinc ophthalmic ointment can cause fetal harm when administered to a pregnant woman or can affect reproduction capacity. Neoymcin and polymyxin B sulfates and bacitracin zinc ophthalmic ointment should be given to a pregnant woman only if clearly needed. Adverse reactions have occurred with the anti-infective components of neomycin and polymyxin B sulfates and bacitracin zinc ophthalmic ointment. The exact incidence is not known. Reactions occurring most often are allergic sensitization reactions including itching, swelling, and conjunctival erythema (see WARNINGS). More serious hypersensitivity reactions, including anaphylaxis, have been reported rarely. Local irritation on instillation has also been reported. To report SUSPECTED ADVERSE REACTIONS, contact Fera Pharmaceuticals, LLC at (414) 434-6604, Monday-Friday 9am-5pm EST or FDA at 1-800-FDA-1088 or www.fda.gov/medwatch. May be applied every 3 or 4 hours for 7 to 10 days, depending on the severity of the infection. 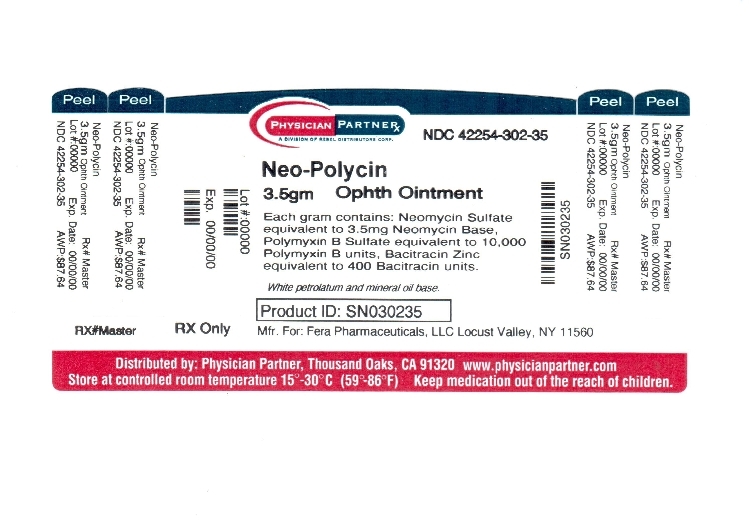 Neo-PolycinTM Ophthalmic Ointment is supplied in 3.5 g (1/8 oz) sterile tamper evident tubes with ophthalmic tip. Store at 20o-25oC (68o-77oF) [See USP Controlled room temperature]. Neo-Polycin is a Trademark of Fera Pharmaceuticals, LLC.